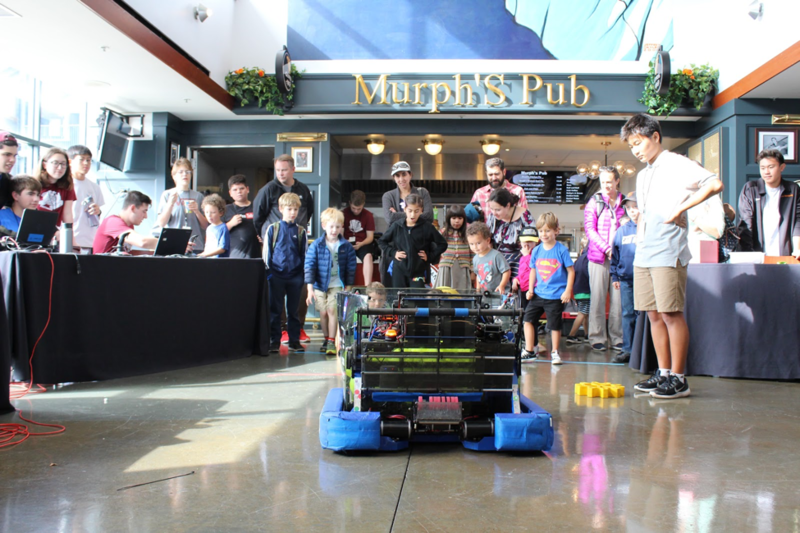 On November 11th, Team 254 appeared at the Bay Area Science Festival Discovery Day to demonstrate our 2017 season robot Misfire. At the event, we used a few game elements like wiffle balls, gears, and a makeshift wooden hopper to show over 2000 people the capabilities of our robot. In addition, we spoke about our experiences during 2017 FRC season and the challenges we faced. 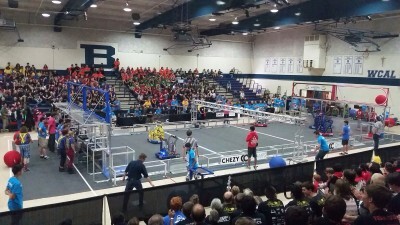 We collaborated with other FRC teams including Team 1868: The Space Cookies and Team 5026: The Iron Panthers to convey the message of FIRST and STEM. This event allowed us to spread our knowledge and experience to our community in the Bay Area. Our experience at Discovery Day not only spread awareness for STEM within our community, but also made an impact on our team. Outreach leader, Yusuf Halabi stated, “My Discovery Day experience this year allowed me to take a new perspective into 254 and our role as an organization. 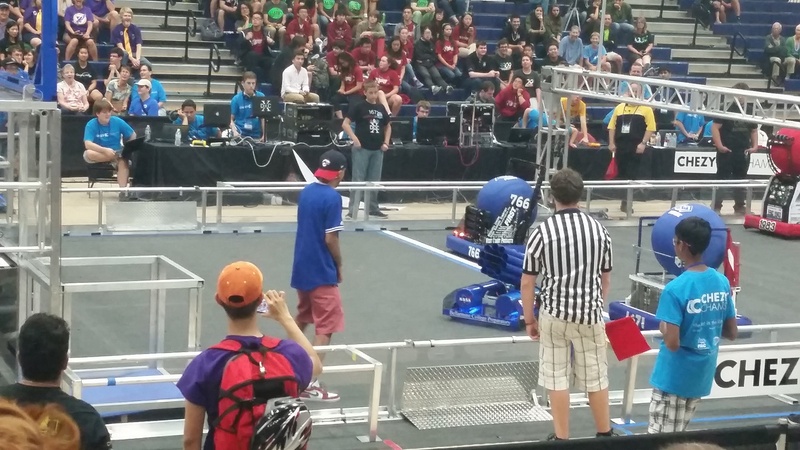 When I first joined robotics as a freshman, I was under the impression that 254 was only good for creating robots. 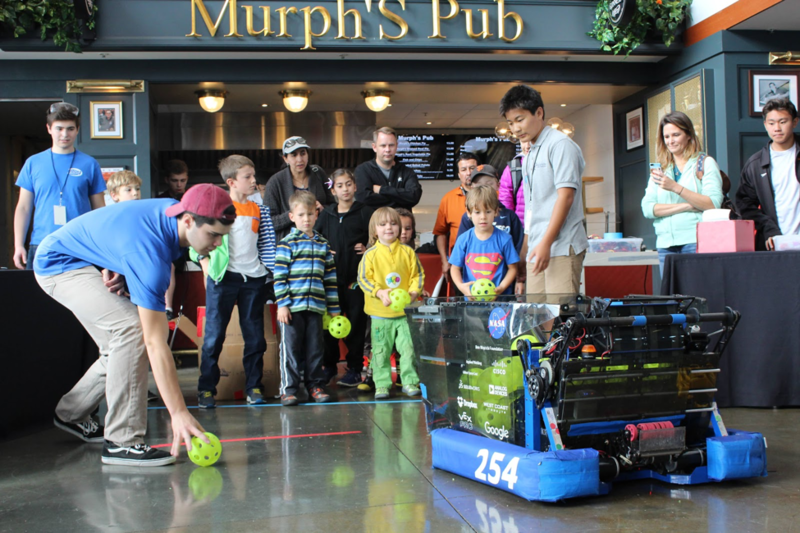 However, my experience at Discovery Day allowed me to realize that serving and supporting the community is just as important as building robots.” Similarly, Team 254 Operator, Themis Hadjiioannou said, “My favorite part of Discovery Day was seeing the joy on children’s’ faces when they saw Misfire shoot into the high boiler. 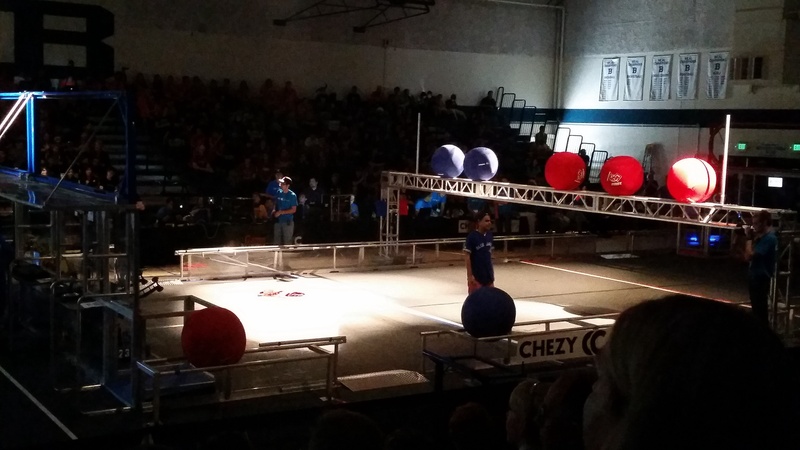 Watching the light in their eyes flash as they observed what a robotics team was capable of struck a chord with me. I thought back to when I was a kid and was inspired by drones and robotics. 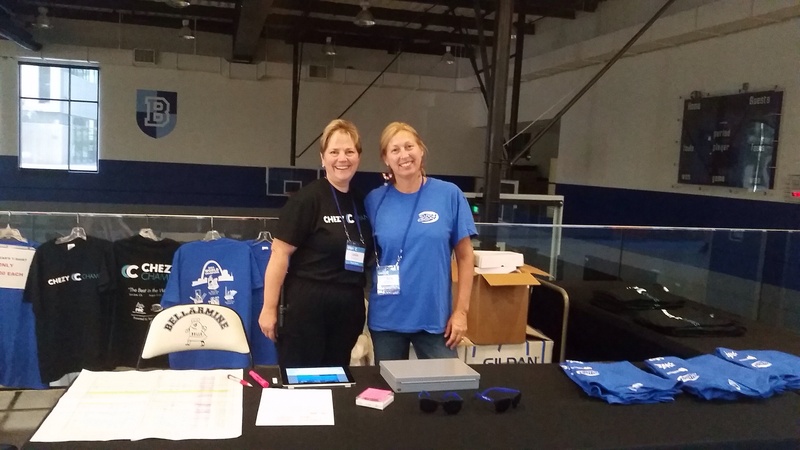 Discovery Day made me proud to be a part of an organization that strives to bring this inspiration to kids around the world.” Overall, Discovery Day was an outstanding outreach event and we wish to continue making such a profound impact in our community! Today teams from across the country gathered to compete in Team 254’s Chezy Champs Aerial Assist competition. After Friday’s hard work setting up the field and teams moving setting up their pits and robots, we’re ready to start a day of competition! I love the smell of robots in the morning. 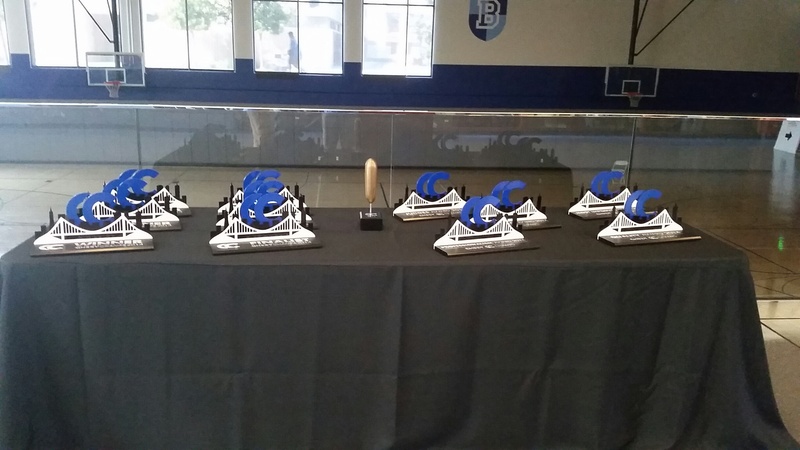 Starting at 8am this morning, teams were allowed into the pits to start modifying and preparing their robots, and teams entered the Bellarmine gymnasium to stake out spots in the bleachers. And about half an hour later Shockwave was released and tested in the field. At 9:30 the opening ceremonies began, introducing our emcee and game announcer, Karthik Kanagasabapathy and Paul Copioli. After all teams had staked out seats in the bleachers and the competing robots were in their ready position, at 10am the first match started! After the first match I decided to take a walk around the facilities. Right behind the arena was the CC swag shop, where t-shirts, sunglasses and other swag were sold. I became aware that other items such as snap backs, volunteer shirts, and even life sized EJ faces (for the true EJ fans) were available through preorder. 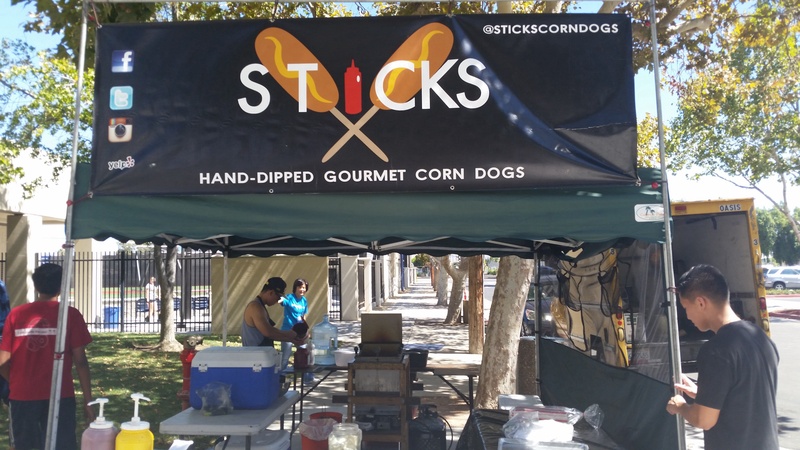 Next to the swag shop were the official Chezy Champs trophies, including the widely coveted golden corn dog for display of GP throughout the tournament. Lastly I headed out to the pit area in Liccardo to check out some of the other teams. At the admin desk, manned by 254’s glorious president Andrew Torrance, I checked in as a CC volunteer and put my super safety glasses on. Q: Where is your team based? A: Our team is based in Clovis, California. It’s like the little brother of Fresno. Q: What is the name of your robot? 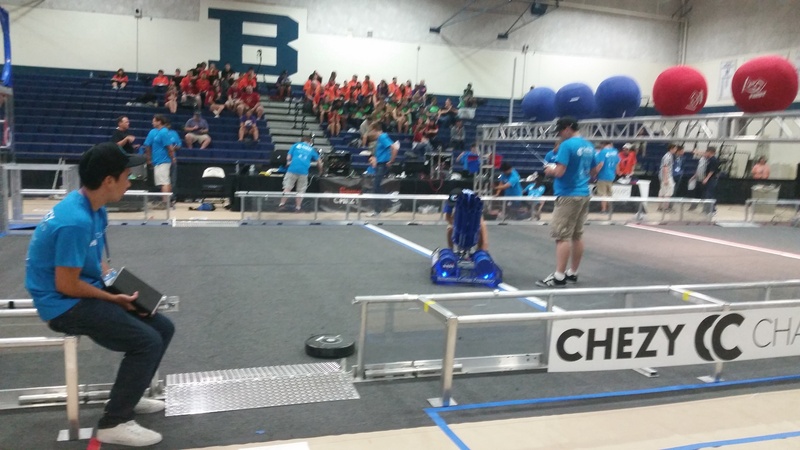 A: The name of our robot is “Doc 10” because Doc Buchanan is the founder of our team’s high school and 10 because it’s team 1671’s tenth year competing. Q: What does FRC mean to you? A: FRC is like the family you never knew you had, and once you’re in the FRC family you never want to leave. Q: What do you think of the Bellarmine campus? A: The architecture is beautiful, it honestly looks like a college campus. After interviewing the Bird Brains, I decided to talk to some of the teams at the other end of the pit. 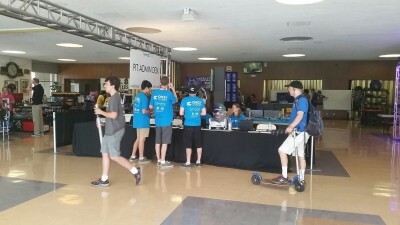 After a few minutes, I found that the Team 4201 pit was open for visitors! 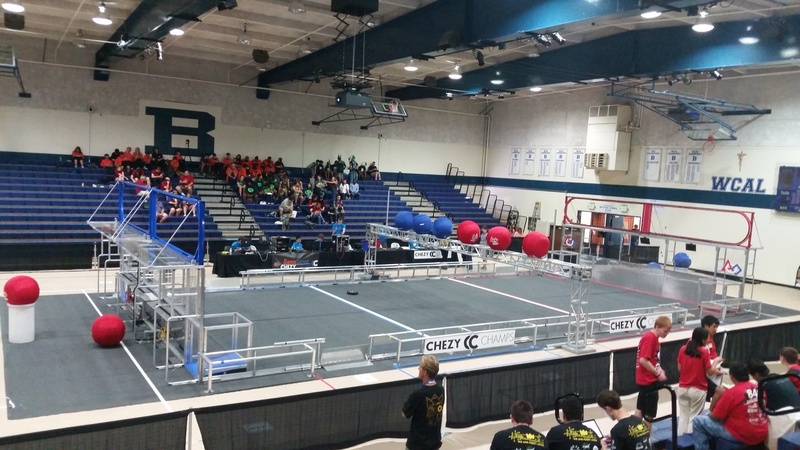 A: Our team is based in Hawthorne, California near L.A.
A: The name if our robot is #straightflexin. The # is part of the name, too! And it can’t be spelled out. A: Since our school doesn’t really have any sports teams, this is our school sport. Like I used to play hockey but there was no hockey team. And, FRC is like the engineering version of a varsity sport. 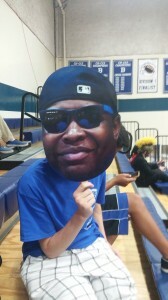 So for me it became a substitute for playing on a team in high school. Really it’s just the best thing ever. Q: What do you think of the campus? A: The campus is awesome, we really love your copper pipes. The water is so clean! 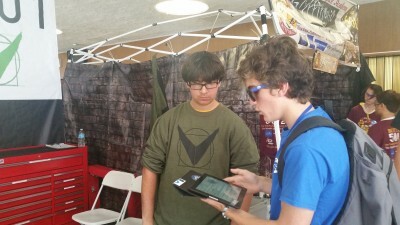 A: Our team is based in La Crescenta in L.A. county, a little bit north of L.A.
A: FRC is one big family, once you’re in it helps you to stay connected with people who share your interests. Oh this is a high school? I seriously thought we were at a college. Wow, it’s really big. After interviewing Team 399 I decided to visit the local food trucks for lunch. 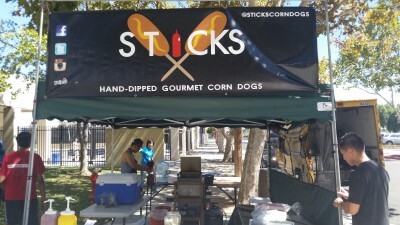 Outside we had the food trucks “sticks” and “scoops,” and inside food vendors sold everything from muffins to pizza. After a short food break/nap in the field, I went back to the arena to make sure everything was ok. Everything was going very smoothly, and all the teams seemed to be enjoying themselves. None of our equipment was blowing up, there were no electrical fires, and none of the gaming servers crashed. I’d say that’s a success! I had a lot of fun meeting and talking to all the different teams, and hope that the guest teams had just as much fun competing in and watching the matches as we did. Thank you to all the teams who showed up, and those who supported us by watching the event live on Twitch. 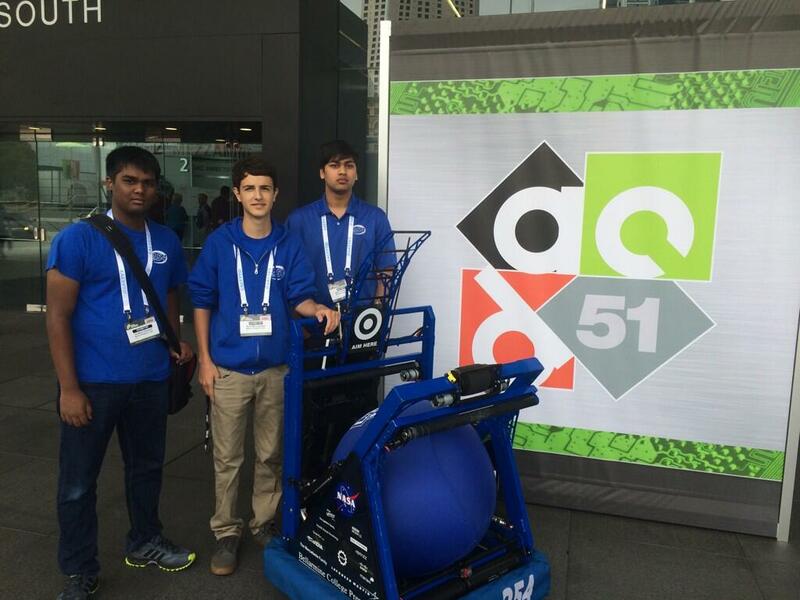 On June 3rd, 4 members from our team, along with our 2014 world championship robot Barrage, gave a demo at the Design Automation Conference at the Moscone Center in San Francisco. Along with countless other booths, Mentor Graphics, a company that mentors and sponsors teams in the Oregon area had a booth where students presented. We were able to demo the short human pass as well as the auto-intake functionality. We explained the basics of the robot and the game to people from the design industry.  This was a new and exciting event for Team 254 and one we hope to attend again in the future.